“Despite leading the world in clean energy investment in recent years, China continues to engage in massive expansion of coal power thanks to policies that effectively subsidise and (over)incentivise coal power investment. This column examines the effects of the 2014 devolution of authority from the central government to local governments on approvals for coal power projects. It finds that the approval rate for coal power projects is about three times higher when the approval authority is decentralised, and provinces with larger coal industries tend to approve more coal power. After three decades of building up its capital stock, China has entered a phase where efficient allocation of capital resources is vitally important for sustained economic growth. However, due to governance problems and market distortions, many key industries in China have experienced serious capital misallocation and overcapacity issues in the past few years, with the energy industry being one of the most salient examples. In line with high-profile government pledges to transform China’s energy system, China has led the world in investment in clean energy. In 2015 alone, China built a soccer field of solar panels every hour and one large wind turbine every hour (Carbon Tracker Initiative 2016), easily outpacing green energy investment in any other country. However, at the same time, China was building two coal plants per week. China approved nearly 200 gigawatts of new coal power capacity in 2015, even though the total capacity of the existing coal plants was 884 gigawatts (Ren et al. 2019). Competition from coal power has led to massive curtailment of wind and solar power generation because power grids were obligated to purchase a certain amount of coal power and thus had to reject much of the energy generated by China’s wind and solar power plants. In the past five years, utilisation levels of all energy types fell sharply as growth in energy supply shot past energy demand (Figure 1 and Table 1). Nearly 50% of China’s coal power plants faced net financial loss in 2018 (Ji 2018). While policy efforts1 have been made to contain the coal overcapacity crisis, under the existing governance structure and market rules, coal power investment in China is unlikely to return in the near future to an equilibrium where plants can still profit under a competitive market price of electricity. 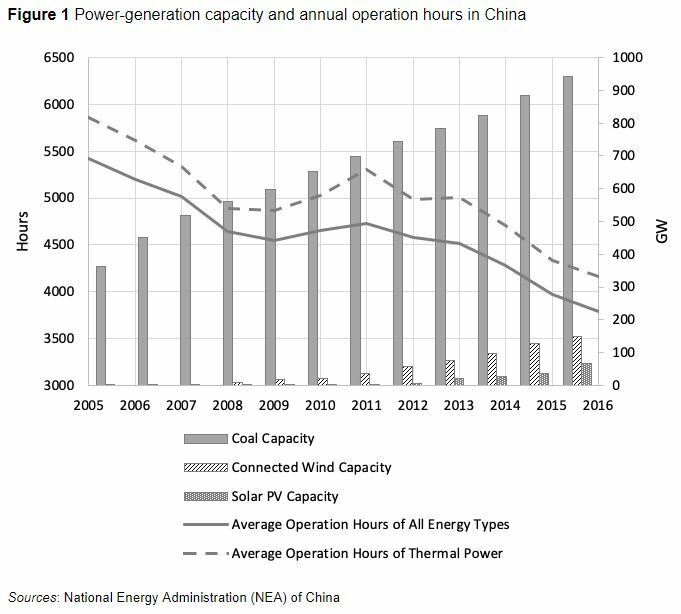 It also seems likely that coal power will continue to crowd out solar and wind power for the foreseeable future, raising concerns that China’s vaunted transition to a less carbon-intensive economy will not be managed efficiently.